This 208-acre tract of land is part of the Mohawk Hudson Land Conservancy. The property, along the Helderberg Escarpment, has geological and historical significance. 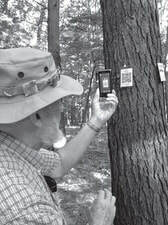 Dan Driscoll, steward of the preserve and KSH trustee, has written a tour of the preserve using audio clips and QR codes. You may also print out the tour and read it at each station.